Not much have been written about what many female folks feel about the World Cup and their husbands obsession with the game. 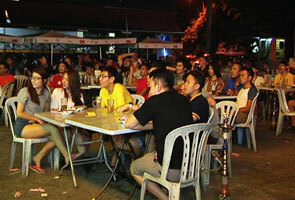 KUALA LUMPUR: The World Cup season is here and most men around the world will be thrilled beyond words, shouting at top of their lungs in support of their favourite team, forgetting that half of the world will be asleep at that time. These men also will be more than happy to ‘accidentally’ forget all their responsibilities. These unshaken ‘relationship’ between men and football, more often than not, irks women and stresses them out. Up to now, countless articles have been written about how wives and girlfriends should behave during the World Cup season, the rules bordering on giving their male partners the ultimate freedom and be conjoined with the game. A perfect example their (husbands and boyfriends) include, hogging the television remote control, not talking during the game and supporting the team that their male counterparts support. However, not much has been written about what many female folks feel about the whole World Cup hype and their husbands’ obsession with 22 men chasing after one ball. "Please help me in the kitchen and take me out for 'jalan-jalan'. He also should not think of sleeping early or sleep only until the afternoon."